Key West is a unique city, at once peaceful and isolated, but alive with nightlife, shopping and local charm. It has been a favorite destination of the rich and famous since the days when Ernest Hemingway used the Key West lighthouse to find his way home after a night out in the town. If you're going to Key West, take some tips from us on how to get there, where to stay, and what to do while you're in the island paradise. Our recommendations are our best advice, garnered from our own trips to Key West. We don't sell spots on this page, and don't receive pay or anything of value for making these recommendations to our visitors. In a hurry? Key West International Airport is a regular destination for several East Coast airlines. You'll be able to fly directly to Key West from Miami and other major airports in Florida and other southern states, then rent a car or take a shuttle to your hotel from the airport. Check their site here: Key West International Airport. If you'd like to enjoy one of America's most scenic drives, consider flying into Miami International Airport and driving south to Key West. The 160-mile drive takes roughly three and one-half hours, and traverses some of the most beautiful landscape in the country. Plan to stop at one of the many local restaurants along this route and you'll find amazing seafood and other great local dishes, but remember -- don't feed the alligators. For driving directions, visit the Florida Keys website at www.fla-keys.com/ and click "How to Get Here." Driving in Key West is not a problem. Parking is. If you're planning on taking your car to Key West, you should plan to stay at a hotel, bed and breakfast or guest house that provides free parking. Otherwise, the nearest open parking space is in Cuba. Several of the big "name" hotel chains have locations in Key West. Most are just fine. The rooms are generally nice, and there will always be a pool, and likely a bar and a restaurant associated with your hotel. 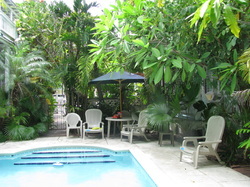 When in Key West, we prefer one of the many wonderful bed and breakfast inns and guest houses that dot Old Town. 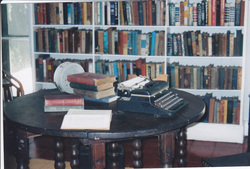 On our last visit we stayed at the Coco Plum Inn, 611 Whitehead Street. It's located one block off Duval Street, and a short walk down Whitehead from the Green Parrot. This B&B is in a beautiful historic house nestled in a lush garden hidden behind a wall and gate. Our rooms were nicer than any hotel, and we enjoyed meeting people by hosting a little "happy hour" by the pool in the afternoons. We can highly recommend this place to you. See it for yourself at www.cocopluminn.com. With over 100 bars in a square mile, and most of them featuring live music, Key West comes alive at night. Chances are, you'll be able to find any kind of music you like, played live, somewhere in Key West. 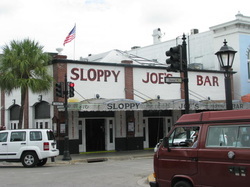 The most famous bar in Key West is Sloppy Joe's (right), but there are plenty of others: The Hard Rock Cafe, Key West, is an excellent spot for a reasonably priced dinner, as is Jimmy Buffet's Margaritaville (both on Duvall). The 120-mile long chain of islands that form the Keys is home to North America's only coral barrier reef, and the nation's only underwater national park. 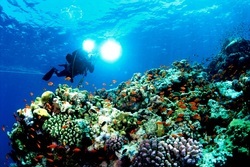 If you are a certified "Open Water" SCUBA diver, Key West has some amazing diving, and you won't need to go far from shore to find crystal clear water and a variety of undersea life. Not certified to dive? There are also plenty of options to enjoy the beauty of the ocean around Key West, including snorkeling or even taking a tour around the island in a glass-bottom boat. Need a map of Key West?